After showing a spy shoot of the first prototype in its initial sea trials at the end of last year, Bruno Abbate ship yard finishes it's first new B41 Pininfarina Aerotop Pininfarina. Based on the hull lines of the best seller that was the G41, this new B41 completes Bruno Abbate's circle which now features all its five cruisers and yachts models designed by the famous Pininfarina firm. This choice has been one of success from Bruno Abbate, especially seeing the feedback and orders the company received for the G46. The B41 builds on some features seen on the G41, although a lot of improvements are seen. For example the galley is among the most spacious in this size, especially when one notes that the G41 Primstist Aerotop Pininfarina has a spacious full beam midships located cabin. Same goes for the lower deck located L-shaped saloon which is opposite to the galley, which although not super in size seems to offer good comfort. 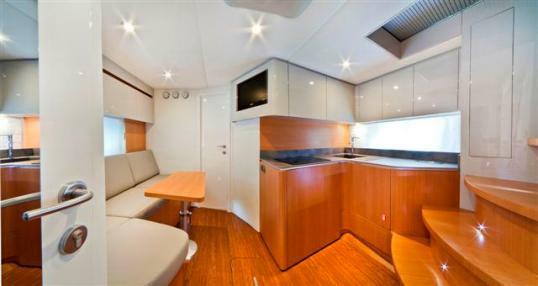 To fore is also a VIP suite or owners room, if one prefers this cabin then to the midships with its three berths layout. Power is Volvo engines from 330 up to 400hp with stern drive propulsion. Hull one featured the new super powerful 400hp engines giving a top speed of 37 knots.